Over the years, I have attended several evenings presented by Hammer Public Programs. They are always interesting and thought provoking, sometimes for several days, weeks, and even years, afterwards. The Hammer Watch + Listen Archive allows the viewer or listener to revisit incredible ideas and phenomenal discussions. The readings and lectures live on in the archives; it's truly a great gift to the public. Accessing the files of the archive is like going to an extraordinary produce section of a really smart grocery store. You are bound to find something in there that will make an incredible soup. At first, I really didn't know what remixing the Hammer Watch + Listen Archive would sound like. For some reason, I couldn't imagine what I would do with these recordings. Why would someone want to listen to a remix of, for example, a talk about who pays taxes? Especially when a talk about who pays taxes might have a lot of complex ideas and information. Perhaps if I had attended the discussion of who pays taxes, I would have had all of that information to process in my memory. I started thinking about how my brain would piece together the details of the discussion after it had ended. I would rearrange the parts that made the most sense to me and simply forget things that did not resonate. 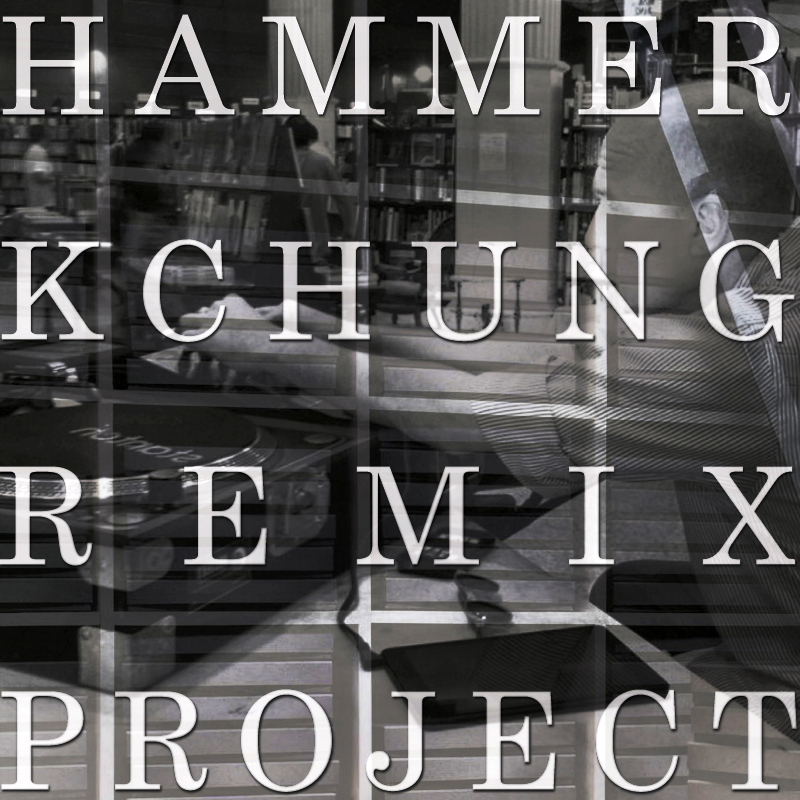 That rearranging of parts in the brain became the blueprint for the HAMMER KCHUNG REMIX Project. When you remix something, you can't be too precious with the material. Even the most wonderful reading of the most devastating poetry might fall apart when you pull at the structure, but if you are too careful you might miss the essence of what you are doing with these ideas and the sound of these ideas. Keith Rocka Knittel worked with an already exciting evening of modern jazz improvisation; he rearranged the interplay of the rhythms and turned the whole thing into something you can dance to. It's actually what several of us do at KCHUNG Radio in the first place. Instead of hunting through our record collections, internet sites, and sound libraries, we pulled source from the Hammer Archive and tried to stay focused on the original recording in order to retain some of the original recording's reason. Every one of my shows on KCHUNG is a remix. I take songs and recordings, sound and clips from movies and construct a mix that ebbs and flows around a theme that develops out of the prep session of hunting and gathering source material. The remix, then, is a recording that sounds like a memory instead of the actual sound. I hope you find this first batch of remixes interesting, and I hope that they encourage you to seek out the original recordings. They are all there in the archive. They sit there frozen on a shelf, in a room until one of us chooses one to listen to or watch. A recording or a video is played from where it was recorded, compressed and cataloged. A robotic arm extends to the shelf below the top and flings the reel over to your speakers and onto your screen. Rhan Small Ernst is the editor and producer of Touch Touch Publishing on KCHUNG Radio, which broadcasts every other Sunday from 8:00-9:00pm and is archived at http://touchtouchpublishing.com/. Touch Touch Publishing on KCHUNG Radio is an hour long show that is mixed and edited before it is broadcast. It's often a thick stew of complex sounds from all over the globe and from no particular time period, assembled with a loose narrative structure to reinforce a theme or an idea. Source: Hammer Forum: WHO PAYS TAXES? Established in 2011, KCHUNG is a creative hub of artists, musicians, philosophers, and tinkerers broadcasting live on1630AM from a studio above a pho restaurant in Los Angeles’s Chinatown. The radio station currently airs 74 live, original shows each month, including reports on wildlife conservation, on-air meditation, gestures of an economic and performative nature, as well as music. While in residence at the Hammer through the end of the year, KCHUNG presents the station’s regular programing on-site as well as new programs developed for the museum. Visitors can look forward to projects such as audio tours composed by KCHUNG and remixes of past Hammer programs.